We will need the following software set up on whatever computer(s) you plan to use for this course. It should all work equally well on Mac, Windows, or Linux. These are somewhat ‘bare bones’ instructions, so ask questions on the issue forum if you encounter any problems. Git is a version control tool that helps developers keep track of any changes that are made to a set of files. We’ll also use it to submit and collaborate on assignments. 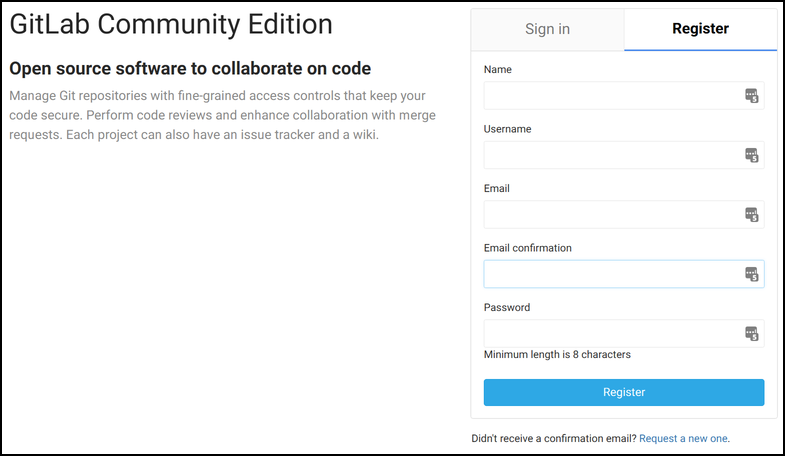 You may have heard of GitHub, a social code-sharing site. We’ll be using a similar site, but on a private server. Create an account at https://gitlab.liu.edu/ (the “Register” tab). You’ll have to use your LIU email address to sign up. You should receive the confirmation link within a few minutes, otherwise check your junk folder too. After completing the registration, you can set a different email address in your profile, if you prefer. Download the Git tool for your platform at https://git-scm.com/downloads and run the installer. The default settings should be fine. Your identification has been saved in /c/Users/league/.ssh/id_rsa. Your public key has been saved in /c/Users/league/.ssh/id_rsa.pub. The editor will pop up with a line that begins ssh-rsa AAAA… copy the whole thing onto your clipboard. Use the upper left menu to go back to your projects list. Click the green New Project button. In the project path box, leave the drop-down set to your username, but enter your last name followed by -CS691 (no spaces) for the project name. Keep the visibility level private, then confirm with the green Create Project button. Below the editor is space for a Commit message. 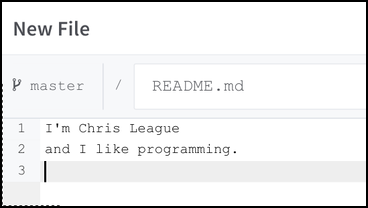 In that box, type something like “Created README,” (it may already be filled for you) and then click the green Commit Changes button. Next, while looking at your project page, click the Settings (gear icon) in the left sidebar, then select Members. In the Search for members box, type league and select the user just named league, with my picture. Change the permissions drop-down to Developer and then click the green Add to Project button. Now we’ll use the installed Git system to connect a folder on your machine to your new project on the GitLab server. After the address, add another space and then the name of the new folder that will be synchronized. I’d recommend just naming it after the course (CS691 or maybe CS691-repo). Now you have a new folder containing your README.md. Just add another sentence or so to the file. Git will be able to detect the change you made, and then you can snapshot it (called a commit) and synchronize it with the project on the GitLab server (called pull and push). The sections below describe how, either using purely the command-line, or using a GUI. Choose one, or try both. The plus signs indicate lines added (usually green), minus signs indicate lines deleted (usually red). You can specify multiple files at once, just separate them with spaces. If there are new files you created and want to commit, you would specify them there too. Once you add the file, they are “staged” for commit, and another git status (optional) will report that. git commit -m "Added another sentence to README"
That hexadecimal number beside master (in my case, 5b611c8, but yours will be different) identifies the commit. Optionally, you can see a history of the commits using git log. The pull portion brings down any changes on the server that you don’t have locally. And then – only if that succeeds – it will push your local changes up to the server. The pull could fail if there is a conflict – changes on the server that interfere with changes that you’ve made locally, in the same files. If that happens, you will have to fix the conflicts locally, add the changes, commit again, and then try to synchronize again. Assuming the push succeeds, you should be able to visit the project page on GitLab and see the updated README file. The GUI window shows the current status. In the screenshot above, we have one file modified, and it already shows the differences. Plus signs indicate lines added (in green), and minus signs indicate lines deleted (in red). To specify what changes to include in this commit (snapshot), we need to move them to the “Staged Changes” section (lower left). You select one or more files in the Unstaged Changes and double-click them or use Commit » Stage to Commit from the menu, or press Ctrl-T. If there are new files you created and want to commit, you would stage them too. Each commit automatically includes a timestamp and your name and email address. (You provided them earlier, using git config.) But you also have to specify a “commit message” – a short piece of text that describes what you changed, or what you’re committing. Type your commit message into the box in the lower right. Then you can hit the Commit button. The status bar at the bottom of the window will say “Created commit 5b611c8” or similar. That hexadecimal number (yours will be different) identifies the commit. Optionally, you can see a history of the commits by selecting Repository » Visualize All Branch History from the menu. Use Merge » Local Merge. The fetch brings down any changes on the server that you don’t have locally. The merge portion could fail if there is a conflict – changes on the server that interfere with changes you’ve made locally, in the same files. If that happens, you will have to fix the conflicts locally, add the changes, commit again, and then try to synchronize again. 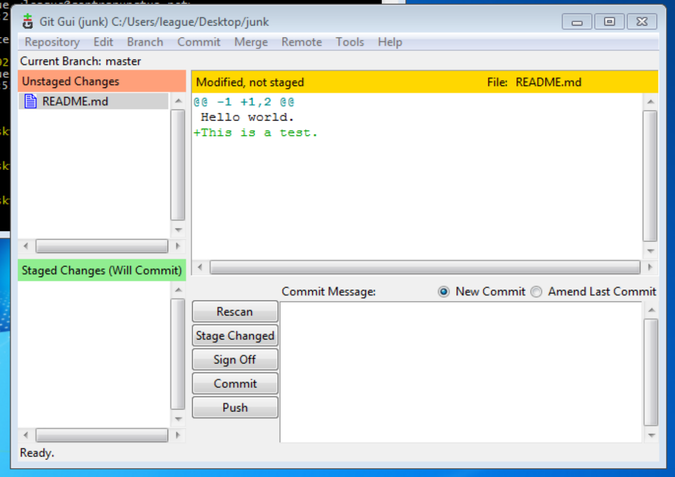 Next, you can hit the Push button next to the commit message box, and confirm it in the following dialog.